I used to think the older I got the more stuff pissed me off because that’s what getting older does. The older I get the more thing’s piss me off because I compare then and now – and now is found wanting. 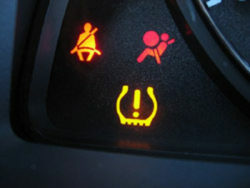 The wife’s tire pressure light comes on in her car. She’s all in a tizzy because she’s afraid the tire will fall off on the freeway. There’s no talking her out of that. So I look at the tire, and yes, it’s lookin’ down a bit. Being a handyman I dig out the wiz-bang electric tire pump from underneath a pile of stuff in the garage and get ready to put some air back in that baby. The last person to borrow it returned it all busted up and never said anything. A tire pump is one of those things you don’t need very often, but when you do – you need it. So I tell her let’s go to the gas station up the street. These places usually have something to put air in your tires. I told her to grab some coins because nothing is free anymore and I suspect we’ll have to feed the machine. Yes indeed, we had to feed the machine. $1.50 to pump some air. The delivery of that air isn’t. $1.50 – think about it. 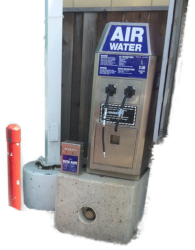 And sitting right next to it is another machine that wants $1.50 to put some water in your car. It wasn’t too many years ago it would have been free or maybe 25-cents. This is one of those stations that sell gas and makes fortune off its convenience store. It used to be air and water was a service for their customers. Places like this no longer have services – that have profit centers. Their idea of a service is contract with some company to install the water and air machines and take a cut. I wouldn’t expect these machines to be used more than a couple of times a day and the convenience store gold mine could easily absorb the cost. I also wouldn’t expect management to even think of that. This entry was posted in Grumpy Seniors by grumpyguy. Bookmark the permalink. the windows FREE? as he filled your tank with gas.